The initial part of our interior design service is to listen carefully to your needs and ideas. We take into account your lifestyle and the way you use your space. Good interior design will give you a home or work space that functions well and reflects you. As well as great design, the organisation and logistical aspects of an interiors project are where an interior designer can prove their worth. Good management is essential as the decoration of your space gets underway. The finer details matter as much as the bigger picture and these make the design. 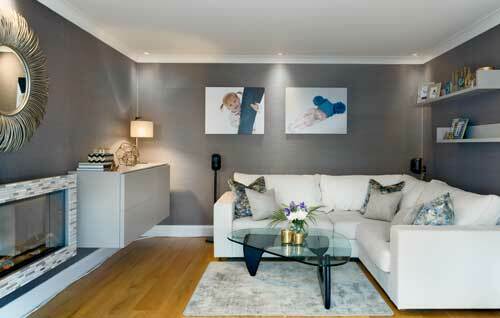 Finishing touches such as art work, soft furnishings and accessories really add to the overall feel of your space. “Working with Angela at Three Interiors was a delightful experience and an excellent constructive process. Together we agreed a brief, the interior design concepts and overall budget. Then Angela effectively took over and managed the whole process but always keeping me informed and agreeing with me as the client, everything from developing the designs for each room, the mood boards and the items to be ordered. Angela also arranged the delivery schedule, the installation and ensured the rooms were completed in line with the agreed design, schedule and budget. Overall a really good job done with excellent project management. I am very happy with the results and would definitely use her services again on future developments”. Three Interiors came to design our bedroom. We already had some furniture that we wanted to keep, but really needed help to pull everything together and add some more storage. Three Interiors have done just that and more. Amongst other things, we now have some really clever storage, lighting and a beautiful new carpet and curtains. Thank you Angela for all your hard work! Three Interiors was responsible for the design of our ground floor extension which included a kitchen/dining area, lounge and playroom. We’re thrilled with the results. Angela was able to take our architect’s plans and make them even better. With just a few tweaks, such as designing a large window seat in the kitchen/dining area; the space really suits our family. Angela designed and sourced a lot of furniture for us and we also had some bespoke pieces made, which sounds expensive but we think are real value for money. We would highly recommend Angela and her team. I would strongly recommend that if you are looking for an interior designer who will put your visions of a dream home into reality, you look no further than Angela Bamforth from Three Interiors. Angela transformed my shell of a house into my perfect home. Angela listened carefully to my brief in an extremely professional yet informal manner, she met my budgets and dead lines without fail, project managed, sourced, and delivered in the highest possible manner. She is very focused yet easy to work with, and managed the contractors and project effortlessly. She made the process of refurbishment enjoyable, exciting and fun. She is extremely organized and took all the 'burden' of the project away from me. I am certain I could not have got the same result from anyone else. Save yourself the time and energy of searching for the right interior designer, Angela Bamforth is the one! Angela, from Three Interiors, is an exceptional interior designer who is passionate and extremely knowledgeable about her work. I invited Angela to our newly built house that I was struggling to make cosy and homely. Immediately I liked her professionalism and I was very happy with the suggestions she made which completely transformed our lounge from a room that was barely used to a room that all the family love spending time in. My family and I were so pleased with her work, we asked Angela to work her magic on the rest of the house. Her project consisted of choosing new wall colours and/or wall paper, artwork, lights/lightshades and new pieces of furniture in all the rooms. In every room she had to work with items that I had already purchased which in my opinion is far more difficult than starting from scratch. Angela’s strength lies in her ability to really get to know her client and to help encourage them to consider ideas that may fall slightly outside of their comfort zone in a way that is not forceful. Thanks Angela for transforming our house into a home perfect for me and my family." It was lovely to meet Angela and discuss ideas for my summer house. Angela came up with some great ideas of how to use the space and create a multi purpose area which incorporated a office space, kitchen and extra living space all in one room. I wouldn't have been able to create something as potentially unique without her help. It also helped that Angela had similar ideas on colour and the use of materials as myself. So I really felt that she knew what I wanted to achieve. Thank you for all your help! Also thanks to your joiner too! Lovely chap. "What I got from Angela at Three Interiors was exactly what I wanted. I imagined that having an interior designer meant being committed to spending lots of money. I love my home and I didn’t want to drastically change things but I wanted to walk the house with a professional to get advice on what colours would look good and layouts for pictures and ornamental pieces etc. What a lovely time I had with Angela, she really helped me to fall in love with my home again by explaining what she would do and why but worked with what I wanted. She helped me decide on so much and so I really felt I had made the right choices. What I committed to was paying for her time and it was money very well spent. Thanks Angela!"